S’mores Snack Cake is a simple chocolate cake topped with graham crackers, chocolate chips and marshmallows. A super easy and tasty twist on a campfire favorite! Today we are celebrating two years of the Sunday Supper Movement by throwing a virtual birthday party! Everybody is sharing a favorite Sunday Supper moment and recipe. Honestly, each week that I participate becomes a new favorite – from the creative themes, to the wide variety of delicious recipes to the most important of all – each and every one of the amazing bloggers! The Sunday Supper group is smart, supportive, creative, fun and truly feels like a family. 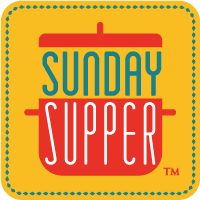 So I decided that my favorite Sunday Supper moment has to be the very first time I joined the virtual Sunday Supper family table – last September 1st (theme: Labor Day). The recipe I shared was S’mores Brownies. Since we are celebrating a birthday of sorts today, naturally we need to have cake! S’mores Snack Cake seemed very fitting for this special celebration. Just like the S’mores Brownies, S’mores Snack Cake is super easy to make. You can use your favorite cake recipe or simply use a box mix – either a chocolate or yellow cake work well. Bake the cake as usual and then within the last 10 minutes, take it out, throw on the toppings and return the cake back to the oven to finish cooking. The marshmallows puff up and get browned and the chocolate melts. It’s delicious, takes like a s’more and is a little bit messy – just like anything s’more related should be! Be sure to check out the links below to see what the rest of the Sunday Supper group made for today’s celebration! In a large bowl, stir together cake mix according to package directions and pour into prepared baking pan. Bake for 20 minutes (or with 10 minutes left for the cake to bake). Remove cake from oven and sprinkle graham crackers crumbs, marshmallows and chocolate chips over the top of the cake. Return to oven to finish baking (about 10 minutes), until a toothpick inserted into the center of the cake comes out clean. Remove to a wire rack to cool completely. Enjoy! A plastic knife works best to cut through the marshmallow topping. I totally agree with you. . Sunday Supper is a great group of people. . so supportive and encouraging! and love this Smores snack cake . . pinned this and the brownies, yummm! This is so cute…must make next time we have company. How can anything s’mores be anything less than fabulous?!?!? Loved your cake back then, love it more now! I have loved being a part of Sunday Supper, and cooking along with everyone each week. Cheers to another great year! Nice recipe. Thank you and have a great Sunday.